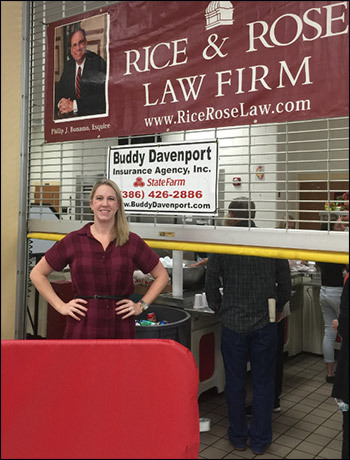 Rice & Rose Law Firm in Daytona Beach, Florida sponsored the annual spaghetti dinner fundraiser for New Smyrna Beach Community and Alumni Providing Scholarships, or "NSB CAPS." The organization provides college scholarships to needy and deserving graduates of New Smyrna Beach High School. Associate attorney, Kayla Hathaway is pictured with the firm banner featuring partner, Phil Bonamo, a proud graduate of New Smyrna Beach High School himself.